I hadn’t blogged for a long time but I knew an opportunity would arise as soon as I had booked my tickets to India, for our ritualistic annual voluntary booster shot of cultural roots, visiting family and friends. For an Indian living and working abroad, my wife’s and mine annual holiday locale is pretty much narrowed down to one location, that is, India, and while friends and colleagues boast of exotic destinations for their holidays, I just say I am heading home…to Bengalura. Puliyogare vs the world, and puliogare wins hands down all the time. the start of Day 0 was spent heading home from the airport mesmerised, by the exponential growth in traffic and the gigantic concrete flats, popping up in every nook and corner of available land. Bengaluru (or Bangalore), my hometown, once proudly carried the name tag of ‘Garden City’ with greenery everywhere but with a rapid growth fueled by the IT and the industrial crowd, I think it had lost that crown. The drive home was accompanied by a cacophony of honking four, three and two wheelers but thanks to a jet lag, my snore reached a comfortable decibel level to match that of the traffic. I set aside Day 1 to tackle my lapsed life insurance policy, to buy a temporary SIM card and to deal with the Honorable Prime Minister’s demonetization drive. I chose the demonetization drive first as I had a few invalid currency notes totaling Rs 2000 which I wanted to deposit into my account I held in India (every little helps when you are on a vacation) and thus equipped with my Aadhar card (India’s id card) I headed to a well known private banking institution where I held a couple of accounts. Everything went fine until the teller punched in my details and the system spat out errors. She blamed the software and kept up a furious pace of clicking and typing and the machine answered equally by spewing out more errors. I waited a couple of minutes before I asked her whether it was my account which was at fault. For the uninitiated please go ahead now and google NRE, NRO and NRI accounts. A huge sigh of relief was visible on her face as she passed the unwanted customer to the manager. The manager explained the string of documents that I need to sign before I can deposit Rs 2000. My Dad had a tough time understanding why a bank would not accept the customer’s money and this reiterated his faith in Nationalised banks. We accepted defeat when the manager herself recommend that we save ourselves the hassle (read: save herself the trouble) and deposit in one of my Dad’s account. Note to self: Honorable PM’s grand idea of weeding out illegal money hoarding earns him a negative mark and furthermore….switch accounts. Task 2 was to revive a life insurance policy which had lapsed a few years ago due to me not paying the yearly premium. This policy of mine is held in the state-owned Life Insurance Corporation (LIC) of India whose origin lies in pre-independent India. We entered the rather unassuming building and headed straight to the 5th floor as indicated in the post I had received. The office wore a deserted look, damn it, it was lunch time! As my Dad and I wandered aimlessly, a man walked up to us and very politely asked how he could be of help. I was clearly taken aback by his willingness to help. There is no tone of sarcasm in my writing, I simply truly was taken aback. He explained what had to be done, which department I need to go and the person in-charge I had to speak to and he went one step ahead by asking us to follow him. He led us down the winding stairs, went right up to an empty desk whose owner was away for lunch. He sat us down and went on to explain the process in greater detail and then went on to sing songs of glory of other products as well and that’s when it hit me, he was the ‘agent’. His visiting card confirmed my suspicion, his title had the word agent in it. But despite not getting any contact details from me that would have enriched his rating, he quietly excused himself but not before casually noting down a few of my details in his small black book. I was on someone’s ‘hitlist’. He wished me good luck and left. And he was one the most and only helpful person of the day. To head back home we hailed an auto rickshaw and I shall name the driver as Opinion/Complaint Raja (King). He was silent for a minute and then said something that neither my Dad and I could comprehend. 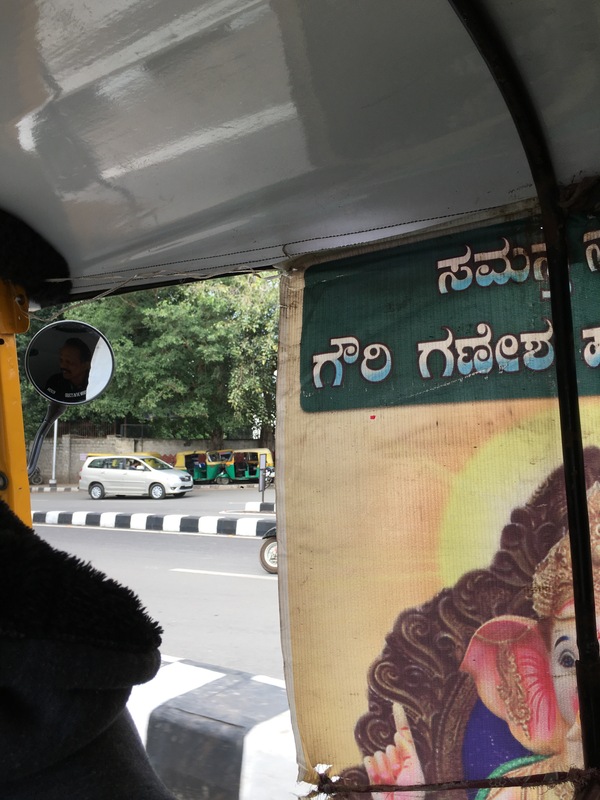 He seemed irritated and then looking up at the rear view mirror with his eyes meeting mine, he asked, “Kannada baralva?” (Don’t you understand Kannada?). We replied in unison, “Kannada barathey,” loosely translated as – we understand. Now that he had established that the had two pairs of ears that cannot ignore him, he started a running commentary of all the things that he could see that irritated him and that included everything! Complaint 1: A man driving his scooter transporting a package of new empty plastic bottles. Complaint Raja’s view was that the guy had probably collected old bottles, washed them and passing them off as new. Complaint 3: A popular hotel getting a fresh coat of paint and refurbishment work. Complaint Raja was stuck between disgust and anger at the apparent show of wealth and unnecessary glossy looks of its facade. My Dad replied that my wedding reception took place in one of hotel’s grand halls. Complaint Raja’s eyes met mine through his rear view mirror and I shall leave it to your imagination to picture that singular moment. Complaint 4: He didn’t spare his peers too, but I actually agreed with what he had to say. A row of auto rickshaws were parked near the Bangalore Turf Club. He complained that his fellow auto rickshaw drivers should be plying the roads and earning a decent days wage rather than spend all their earnings on betting. He’s right. Task 3 was to get my phone running on a local SIM card rather than having to shell out a bomb on roaming charges. Few hours and two network carriers later- SIM not supported. iPhone fail. What a splendid read and find you are. Happy to have found your blog! New year wishes your way! Noorain, it is indeed a pleasure of mine when I dropped in to your site and found out that you are a fellow foodie! And what more pleasure than to be welcomed by a box of baklava…awesome! Thank you for your comment and I am glad you liked the post. I hope to keep the momentum going. May the best of the best, head your way in the new year.